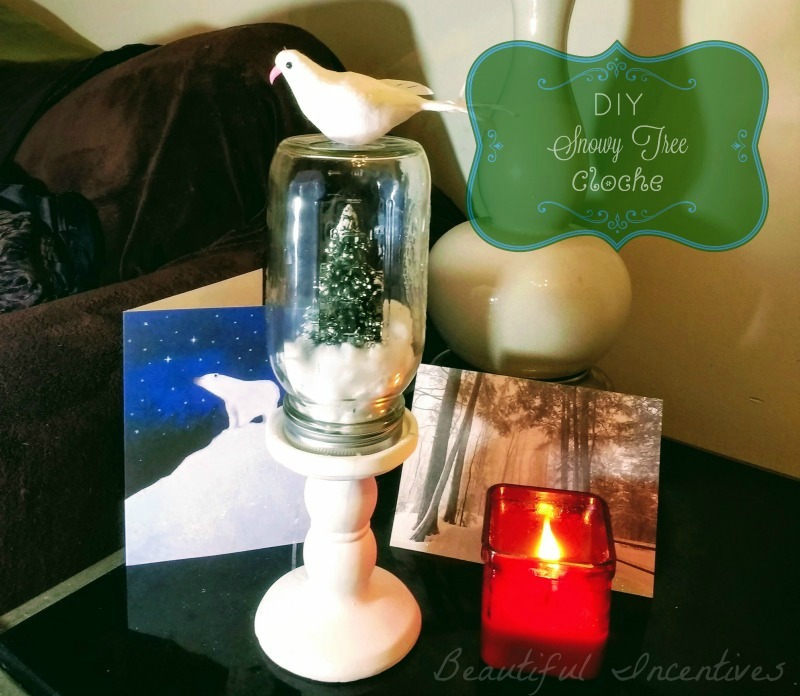 Beautiful Incentives: DIY Snowy Tree Cloche. Growing up, i've always loved snow globes and little scenery cloches or terrariums. Especially of the wintery variety. Never did I actually embark on making my own until now. I love the Autumn season, but winter brings with it it's own Whimsy. Let the fall of Autumn commence into a blanket of glittering snow. Without the pee, that inevitably taints it. We can't have it all, but we can have it in the form of a beautiful keepsake to enjoy. 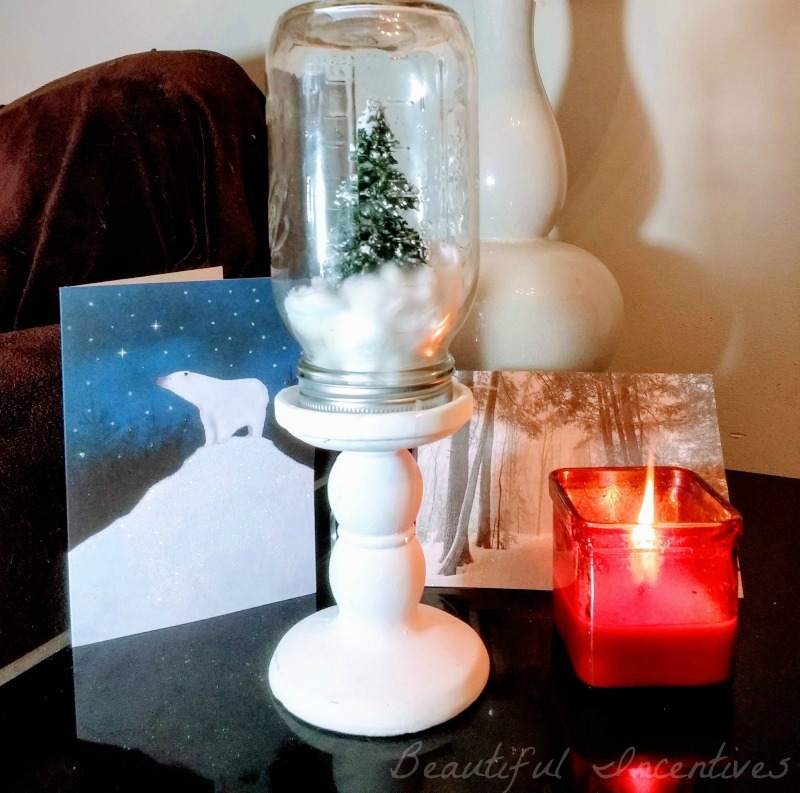 This Wintery whimsical snowy tree cloche is SO cheap and easy to make. I wanted to make it a very affordable addition to one's decor after all the money you probably burned shopping for gifts. I know we all don't have any more cash to burn, so if you're in a crafty mood, this will brighten your day and add a little something special to your Winter decor. This project was absolutely free for me, as I had everything on hand, but everything you see is easily purchased. 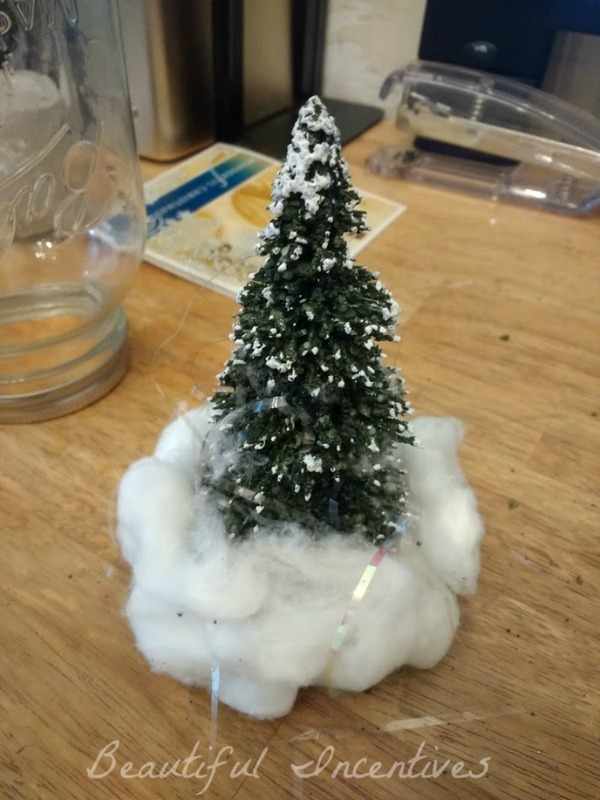 $2 Snowy tree (Similar): Found at Joanne Fabrics. A pack of two or four, I think. Often you can find them for $1 at Dollar Tree and other craft places. $1 Large Mason Jar. I got mine from a BALL mason jar pack that I already have on hand. $1 Cotton balls: most of us have cotton balls in our bathroom stash. If not, 1 package is $1 at Dollar Tree. $1 Candle holder at Dollar Tree. These went so quick, but I see them restocking. I missed them the first time, so I was very happy to find this one. $1 White doves, pack of two: Found at Dollar tree. If you cannot find this, you can sub for any type of wintery top you can find. Check out your local Dollar Tree or crafts store for some beautiful ornaments you can use as one! Although, this tree cloche is perfectly beautiful without the dove. Total spent: $5-6, but probably much less, as most of us have these things! Grab a handful of cotton balls, enough to cover the bottom of the tree and fill about an inch thick high or more. Stretch the cotton balls out to look like snow. You can glue the balls to the tree, but I chose to make this a sort of take a part project to store easier in my Christmas box. Everything in this project can be taken apart. Then take your mason jar, flip it upside down and gently push the tree and cotton through it, whilst holding everything together as best you can. You can use the tips of your fingers to resituate the tree. I'm not gonna say this isn't annoying, but you will get the hang! Once you have it where you want it, very carefully screw the lid on. The white dove is a symbol of peace and it's a great subtle message to spread in your decor. There you have it. A cute little snowscape capture. This definitely looks more expensive than it's price! If you cannot find a tree with snow, you can add little dabs of acrylic paint to get the same desired effect as well. Very simple, very cheap , yet beautiful decoration.